Detailing the physical features, habits, territorial reach and other identifying qualities of the Leafhopper Assassin Bug. Leafhopper Assassin Bugs are efficient predators with varied diets, eating more than just leaf, plant and tree hopping insects. Despite its common name, Leafhopper Assassin Bugs will attack and eat any insect it comes across. Using stealth, speed, and strong forelegs to hold a victim, the Leafhopper Assassin Bug kills using a long, sharp fang to quickly and repeatedly stab its prey. This fang can also stab fingers and arms, inflicting a mighty painful wound. Aside from intense pain, however, the Leafhopper Assassin Bug is not lethal to humans and a 'bite' does not require medical attention. Avoid rough handling or scaring the bug and it is content to ignore humans. It is more interested in hunting for insects and spiders on flowers and branches. Though its manner of dispatching bugs for meals seems brutal, Leafhopper Assassin Bugs can help in gardens infested with pest bugs, however, they do not discriminate between what gardeners consider helpful and harmful bugs. Adults and nymphs may be seen near each other, but they look nothing alike. 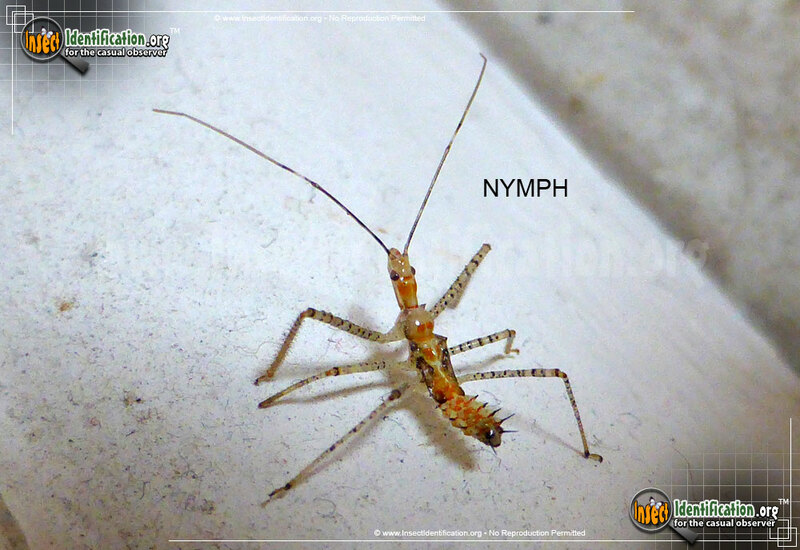 Nymphs are small, spiky and white with orange on the dorsal (back) side. Adults are slender and long with brown bodies, orange patches on the back, and have green legs. Both life stages are good at what they do: eat.